Yep, I still can't think of what I want to call these posts yet and soon I fear I will run out of Friday themed titles and all hell is going to break loose. Shoutout to Rebecca Black for today's TGIF nonsense. This week has kind of been a blur. Not because I've been busy or anything. In fact, I've been so unbusy that I'm driving myself crazy. I fear I'm becoming a hermit. Just kidding. I just think that my body is preparing me for at least two weeks of non-stop socialization. But even with a boring week, I still had time for new things, which are always fun to ramble about! These suckers have been all over my Instagram. Since I haven't been buying clothes all summer and I occasionally get the itch to spend the money I'm making, I've been really into sunglasses. They're my security blanket in terms of fashion. I don't like going anywhere without them. What's another pair to add to my collection? These ones are especially fun with their odd cat-eye shape, ridged edges, and subtle studs that catch the light justtttt right. I just think they're a really flattering shade of grey and are mega-light to avoid any cramping or discomfort behind the ear (you know what I'm talking about). They just add a little bit of snazz to an ensemble and I adore them! I've been dying for a pair of Miu Miu sunnies for a while, so it's always nice when you can prove the "you can't always get what you want" theory wrong from time to time. People have been telling me to listen to podcasts for months. Months. Have I? Of course not. I never do things that people suggest that I would like even if they're always right because I'm lazy and non-committal. Totally kidding, but I always say that I'm going to watch/read/listen to things and then I just...never do. I'm that deadbeat boyfriend that always gets dumped at the end of movies because he just never does the things that he says he will! Anyways, so, the Monocycle podcast. Leandra Medine is one of my favorite human beings to ever walk the earth and I find her voice (both her actual voice and like, her writing voice and just all around personality) adorable and comforting. Comforting? Kind of weird, but you know what, she sounds like she'd be a really great friend and I dig that in a person. I've listened to a handful of episodes and fully plan on listening to most likely all of them during my upcoming bus rides and flights to keep myself entertained after I finish my books. I love that the episodes are on the shorter side, only around seven to fifteen minutes per episode. It's much less daunting than hour-long podcasts that I've seen. Not that there's anything wrong with hour-long episodes, but you know, I'm just trying to dip my toes in. I love that the topics, while some relating to fashion, branch out into mental health, the "fake it" mentality, getting dressed, body image, and so many more. This blush already got a feature in a post last week, but you know what, it deserves to be talked about again. I really do love this shade and formula and everything about it. 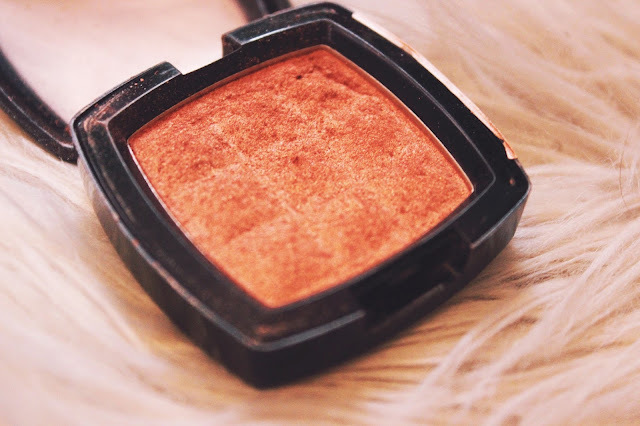 It's such a gorgeous warm color and with a light hand, it blends so seamlessly into the skin. The shimmer is so subtle that it brings a natural warm glow to your cheeks. I just can't get over how pigmented this blush is for six bucks. This is a biggie, guys. I've seen talk about Buzzfeed Unsolved, but like the naive piece of poo that I am, I thought "how good could this actually be?" Then my friend wrote an article about her definitive list of the creepiest episodes and when I told her I'd never actually watched them, she made me FaceTime her that night so we could watch a few together. I binge-watched the entire 30+ episode series last weekend and watched all of the postmortem Q&A sessions this week because my life felt incomplete without a new episode to watch. It's just two guys talking about unsolved true crimes and supernatural stuff whilst they wheeze. It's beautiful. Sometimes they just talk about crimes and the theories behind what happened and who could have done them. Other times, they go on site to haunted places trying to gather evidence that perhaps the supernatural is real. Ryan, the man with perfect teeth, is a believer, whilst Shane is a skeptic and will walk into supposedly demon haunted areas and just go "Hey demons, it's me, ya boy." Honestly, it's just a beautiful series and y'all should definitely waste your precious free time watching it for some lulz.